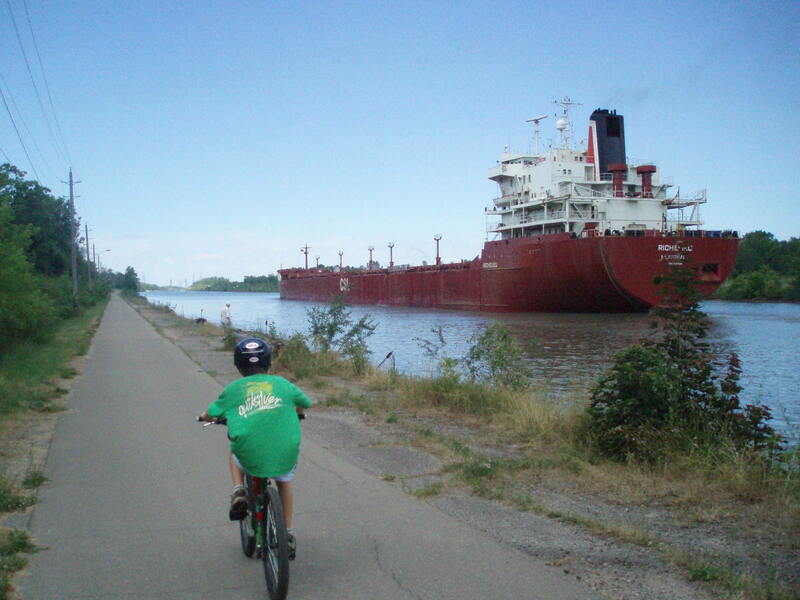 Welland Canal to St. Catharines | Get on your way! This daytrip is by motor coach and bike, and canal! And it’s simple, just place your bike beneath the bus. Just a few hours later you’re in Port Colborne, on your bike, racing great ‘Lakers’ north along the Welland Canal Trail – and winning! Pick up a copy of the Niagara Region Bike Map to find your way easily between Lock #7 and the return bus in St. Catharines. Recommended – for all riders, 8 to 88! The route is almost perfectly flat. For comfort and safety, always bring along a Niagara Region Bicycling Map or print outs. The Niagara bike map is essential on this route to find your way along the municipal trail between Thorold and the St. Catharines bus terminal. Niagara bike maps are available along the Welland Canal Trail ride – in Port Colborne at Pedal Bike Shop (at the Main St. W. bridge), and – in Thorold at the Lock 7 Visitor Centre ($2). Take your time! The buses in Port Colborne and St. Catharines are six and eight hours apart, so there’s time to explore Port Colborne, rest in Welland, get lost a few times, and catch the bus in St. Catharines. Arrive early – at the Toronto Bus Terminal at Bay St. and Edward St. (just above Dundas) – to get your ticket. Bikes are not allowed on double-decker buses, but are allowed on single level motor coaches. Ask the driver to store it/them at the back bus bay, away from the luggage. Bring a bungee cord to attach it under the bus if you like. Thinking about staying overnight? Visit Ontario By Bike! for bicycle friendly accommodations in Port Colborne. Carry on cycling, west to Quebec, or east to the USA, following Waterfront Trail Maps. Megabus – Bikes allowed on motor coaches, but not double-deckers.